The City of Beaverton is located seven miles west of Portland, Oregon, in the Tualatin River Valley, It encompasses 19.6 square miles, and is home to more than 95,000 residents. The city is Oregon’s sixth largest and the second-largest incorporated city in Washington County. Located in the heart of Oregon’s “Silicon Forest”, it is also home to many of the world’s top companies such as Nike, IBM and Tektronix, and Micro Power Electronics. Beaverton is also where Carver Technology Consulting LLC (Carver TC) is making a name for itself in cloud computing. Over the past few years, CarverTC staff have increased their knowledge and experience with cloud services as more and more development projects involved cloud development, deployment, and integration. Simultaneously, they began providing support to its clients on planning and implementation of cloud software. In 2016 this was formalized when Logical Operations approached them with an opportunity to prepare students for the NCTA CloudMASTER® certification. 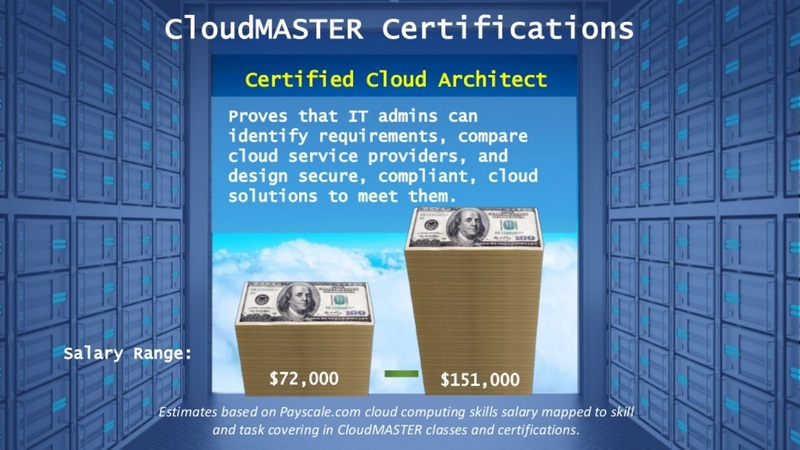 There is strong evidence to support an expectation that holding a CloudMASTER® certification can lead to a fairly large salary! Cloud computing architects that understand cloud solution features, capabilities, and components offered by cloud provides at a deep level so as to design cloud and hybrid solutions for application deployment and infrastructure scenarios can earn from $72,000-$151,000. If this opportunity is right for you, check out the CarverTC training schedule and sign-up for a certification course. If the Great Northwest isn’t close to you, please visit the NCTA CloudMASTER® registration page and we will help you find a more convenient option.